When I come home from work at night, I just want to stuff myself with the first snack I see. So I started to think about what I could make myself at the beginning of the week that would work for my CKD diet. Dips are easy and eggplant is one of the vegetables that I can eat, so here is another creation of mine – the eggplant poo-poo dip. This dish is not the prettiest. The color, in particular, is not nice. It’s a light brown, grayish, slightly poo-y look. That said, this dip is absolutely AMAZING and I have to stop myself from eating the entire thing at once. Yes, it’s not the prettiest to serve at a group gathering and yes, I can’t eat the whole thing because it would do a serious number on my stomach, but it tastes so good and smooth – I love it. 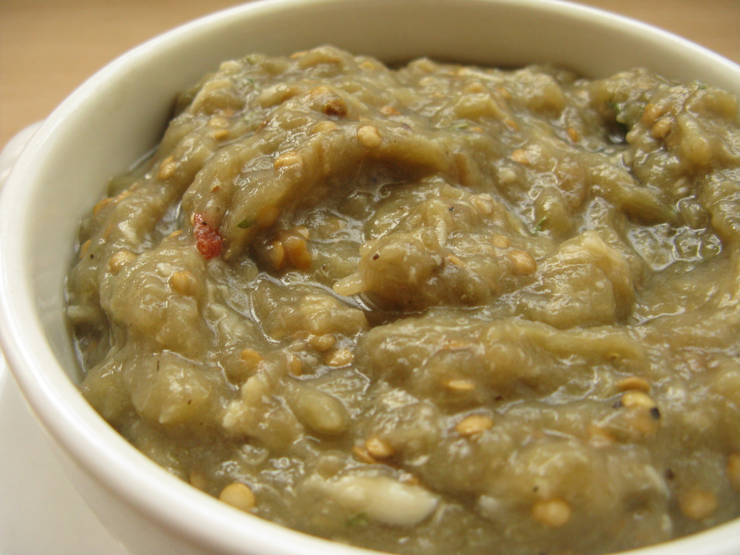 If you are a fan at all of eggplant, you will love this dip. One note on this dip: I’ve learned that eggplant essentially takes on any flavor you want to add, so if you don’t like garlic, you will not like this recipe. Even though there are only 2 cloves, it’s very garlic-forward. If you prefer another spice, feel free to make a swap. I sometimes put a little cayenne pepper in there for an extra kick. Cut off the top of the eggplants and then slice them in half lengthwise (the long way). Lay them on a sheet pan with the skin-side down and brush them in canola oil. Then sprinkle pepper on top (Note: I also use Mrs. Dash Salt-Free Table Mix on the eggplant). Place them in the oven for 30 minutes. While the eggplant is cooking, grate the 2 cloves of garlic and place in a food processor. Add the cumin and another dash of pepper. Once the eggplant has finished roasting, allow it to cool. After it has cooled, scoop out the inside of the eggplant and put into the food processor. (Note: I like to take out some of the seeds while doing this, as I find it’s a lot easier on my stomach without them). Add the lemon juice and grind everything together in the food processor. Pulse it for about 30 seconds or until the eggplant is totally smooth and combined with the rest of the ingredients. At this point, I usually taste it to see if I like it. If it’s too garlicky, feel free to add a little agave or honey. If it’s not garlicky enough, add more. But it should be perfectly smooth and delightfully delicious. You can feel free to eat this on its own – I usually dip some cucumbers or rice crackers into it – or add it to the top of chicken or fish. It’s so good, you’ll want to eat it with everything. Enjoy!